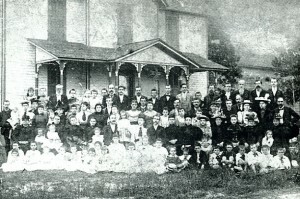 In 1869, at the spot which is now Mayfair Mills, Macedonia Lutheran Church took form and was born under a brush arbor. Gideon L. Greeson, teacher in Company Shops and a Lutheran, served as the leader. The North Carolina Synod was meeting at that time at Friedens Lutheran Church in Gibsonville. Gideon Greeson, Augustus Graeber, and Deider Berheim appealed to the Synod for acceptance of this small group of Lutherans as a new church. At a special session of Synod held at Salem Lutheran Church, Rowan County, on August 14, 1869, Macedonia Lutheran Church, Company Shops, North Carolina, was officially received into the Synod. In February of 1874, the North Carolina Railroad deeded 6 3/4 acres of land to across the tracks from our present location. A number of ministers served the Lutherans. Reverend W. A. Julian was Macedonia’s first. In 1879, under the leadership of the Reverend Whitson Kimball, Macedonia constructed it’s first sanctuary – a little church 36 by 22 feet. It faced Hoke Street on the property we now own. In 1895, the building was turned to face Front Street and additional property was purchased adjoining Macedonia. 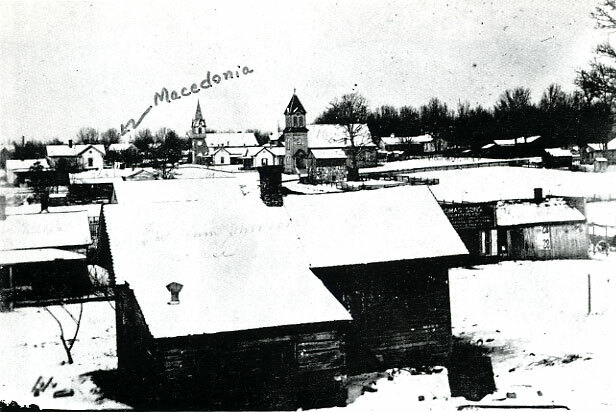 Macedonia began to grow extensively under the guidance of Reverend C. Brown Cox. Serious planning began toward the building of a new sanctuary. This goal was achieved and in 1909 the congregation moved into a new building much of which was crafted by it’s own members. Our congregation weathered many hard years ahead by the love and devotion of it’s many members. 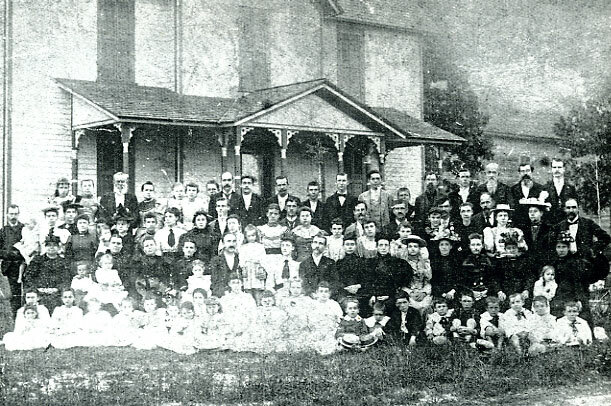 The first Vacation Bible School was held in 1931 under the supervision of Mrs. B. V. May ( Mrs. E. H. Foley). On August 4, 1954, the congregation moved into it’s newly constructed Educational Building. It continues to house and serve us today. 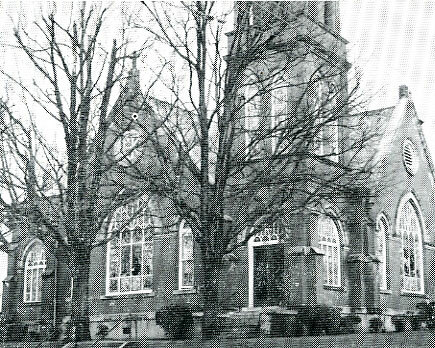 On December 16, 1962, the congregation was forced to move from the old sanctuary into the Sunday School assembly room. Our old sanctuary was in need of major repairs. On February 28, 1965, our new church was complete and ready for the Service of Dedication. From our early days of only 39 members, we trace our strong heritage. Such people as Augustus Graeber, Deider Berheim, Leister Mueller, and Fredrick Heisler laid our early foundations. Now we exist as a family of many names. Macedonia continues to serve our Lord in a sense of joy and giving. May our appreciation and love of those who came before us lead us to greater servitude in the years to come. The Organ: The Three-Manual Moller Pipe Organ was In Memory of Miss Myrtle Moser, and cost approximately $40,000 when the Sanctuary was built (1963-65). When installed it had 27 ranks and 1527 pipes. It has been upgraded several times since. The Cross: The lighted cross over the altar is of hard wood of walnut finish. It stands eighteen feet high. The Stone Reredos: Stone was selected as the material with which to construct the reredos. It symbolizes the stone which was rolled away from the tomb of Christ. The reredos stands on six cubic yards of concrete, and is approximately 45 feet high. It is supported by a steel I-beam approximately seventy feet high. Wood: The Altar, Altar rails, Pulpit, Lectern, and most other wood in the Sanctuary is made of mahogany with a walnut finish. Lighting: The cathedral chandeliers are contemporary Gothic and are of the same design as the altar railing. The Bell: The church bell, hanging between the columns near the carport, is probably the oldest church bell in use in Burlington today. 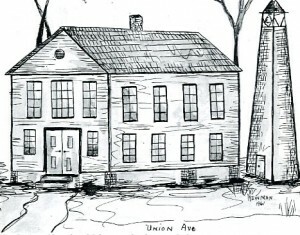 It was struck in 1874 and used in The Old Union Church when Burlington was known as Company Shops. It was purchased by Lutherans and later moved to the first brick church located on this site. It is made of bronze and weighs approximately 500 lbs. More info about the furnishings is in the Dedication Bulletin on pages 11 and 12. 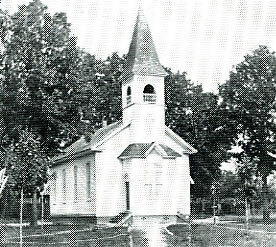 The first permanent home of the congregation 1879-1909. Picture of 3rd Church Building 1909-1962.